TRADITION should never be mistaken for recorded history; yet when properly labeled it is sometimes not without a certain interest. And the tradition is that the system of predicting the probable time of events, here presented, has never been lost to The Brotherhood of Light since the days of Atlantis and Mu. When the darkness shut down on those ancient lands�so the tradition runs�colonies were established where later were to rise Egypt, India, Crete, Peru, Mexico, China and Chaldea�the seven ancient centers of civilization. THE RELIGION OF THE STARS thus transplanted, though modified by the characteristics of each people through whose hands it passed, has finally reached the present generation. Natal, as well as the other branches of astrology, was practiced in each of the countries mentioned. But in Chaldea predictions were checked as to accuracy by the Anu-Enlil series of observations extending unbroken for over a thousand years, in which the events as they happened were recorded with the astrological positions which coincided with them. This gave to the Chaldeans unusual precision in predicting the nature and time of events in human life. The Anu-Enlil series of astrological observations is historical, in the sense that archaeologists have unearthed the clay tablets on which the records were made. But that the Hermetic System was derived from a still more ancient source, and reached us by way of Chaldea, is tradition. My predecessor, from whom I received the tradition, used the system for twenty years before his passage to the higher plane. In 1902, after trying out all the methods in common usage, I adopted it, and found it most satisfactory in an extensive astrological practice which continued up to May 1915. 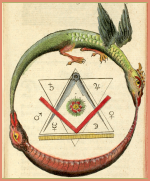 At that time, having discontinued private astrological practice, I commenced teaching it in the astrological classes held in Los Angeles; and in October 1917, as the Hermetic System of Directions, it was published, and since that date has been in constant use in all B. of L. (now C. of L.) classes, wherever held, and has been tested and adopted by a vast number of astrologers throughout the world. 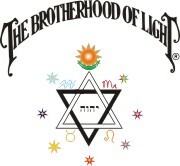 The Brotherhood of Light Astrological Research Department began in April 1924, to solicit data, and since that time has collected, erected, and progressed according to this Hermetic System, many, many thousands of birth charts to the time of some given event. The Progressed Constants for each of the 160 different diseases considered in Course XVI, Stellar Healing, for each of the diseases considered in the book, Body Disease and Its Stellar Treatment, and for each of the events considered in the book, When and What Events Will Happen, were ascertained in this manner. The recurrent plaint of Church of Light teachers, from Miami to Seattle, and from New York to Los Angeles, is that their students are so muddled with a variety of systems that even when they think they are using the Hermetic System, in reality they are clouding their judgment with other factors which, however worthy in their own domain have no place in this method. Some students also seem to think that when they are conversant with Major Progressions and Transits they have education enough. But no one can have that precision of judgment regarding details which differentiates the first class astrologer from the mediocre, who neglects Minor Progressions. And because they attract into the life the little events, from day to day and week to week, and their influence in the life of oneself and one�s friends can thus readily be observed, to become fully conversant with them is even less of a task than to master major progressions. Set up the birth chart of the people you know. Calculate the major-progressed aspects for each important event they can remember, and observe how it fits in with your theories. Calculate the more important minor-progressed aspects in their charts for a month or two ahead, and make an attempt to tell them the nature of half a dozen little events to come, and their dates. Then check the results. And in a similar manner find out how accurate, both as to the event and its importance, your judgment is when based on transit aspects. If you follow this plan until you are thoroughly grounded in the system here set forth, and know just what you can, and cannot, do with it, you will become a good astrologer. And after you have reached this point will be time enough for you to branch out and try to discover additional information. In fact, when you have reached this point, you should, by all means, thus endeavor still further to increase the range and scope of your knowledge. It is one of the cardinal doctrines of science, applicable to every line of research, that so long as a condition can adequately be explained by factors already recognized, no new factor should be introduced into its explanation. Both in delineating the birth chart, and in its progression, we have held tenaciously to this principle, upon which material science has so successfully been able to build its systems. We are sometimes asked why we neglect the Moon�s Nodes, the Part of Fortune, and the Fixed Stars in the birth chart. We do so because, up to date, we have not found any condition in a person�s life which could not satisfactorily be explained by the planetary positions without recourse to these other factors. We do not say that these positions have no value; merely that up to the present we have found no need to use them in explaining the conditions and events in people�s lives. Events occur in people�s lives which can only be explained adequately through the progressed aspects of the Asc. and M.C. We thus progress them, as presently to be explained, as if they were planets. But in the birth chart we do not calculate aspects to the cusps of any other houses, and do not progress planets to aspects of the cusps of any other houses, nor progress the cusps of any other houses in any way; because so far in our very extensive research work we have found nothing that cannot quite as well be explained without such aspects and progressions. It should be borne in mind that an individual with active extrasensory perception can take almost any system, however unreliable it may be to others, and get startlingly precise results. What we have striven for in our presentation of the Hermetic System, however, is not a system of divination; but to find and include all the actual astrological energies which have an important bearing upon human life. It may be that there are yet factors which remain undiscovered; but if so we will include them only when, through extensive analysis, we have become fully convinced that only by their use can certain conditions or events be satisfactorily explained or predicted. Events and conditions are attracted into human lives�and into the lives of all other creatures�due to the activities of the thought cells within the astral form. The astral form of every living thing is composed of such cells, which we also commonly refer to as stellar cells, built by the consciousness accompanying experiences. These stellar cells, the more active of which are organized into the dynamic structures mapped by the planets in the birth chart, have a certain intelligence of their own, and work from the inner plane to attract into the life conditions and events corresponding to the way they feel. When they receive no additional energy from any source, they have only the amount and kind of activity indicated by the birth chart. It is only when, from some source�astrological vibrations, thought vibrations, or the character vibrations of objects�they receive an additional energy supply that their activity is greater than the normal thus shown. While the effect of conditioning since birth, and the present facilities of the physical environment must also receive attention, the chief problem in predicting the nature and time of events by natal astrology, therefore, is to ascertain the time when certain groups of stellar cells within the astral body will receive additional energy; and in what volume and in what harmony or discord it will reach them. Only within the past few years has Einstein�s Special Theory of Relativity become almost universally accepted by physicists the world over, and become the foundation of the physics as taught in our universities. The most essential conception of this special theory of relativity, which is now so widely employed to explain the behavior of high-velocity particles, is the interrelationship between velocity and time. It is held that there is no such thing as absolute time, but that as velocity increases time slows down, until at the velocity of light time comes to a standstill. Conversely, as time speeds up, velocity slows down, until at the time speed with which we are familiar objects tend to move at the velocity physical things are observed to do. If at the velocity of light time stands still, within a single moment of such slow time an infinite number of events could happen. And in a realm, or condition, where velocities are not so great, but are greater than that of ordinary physical objects, a large number of events can happen in a single moment of this slower time. In our dreams, for instance, and to some people when they are on the verge of dying, there are numerous experiences which in ordinary time would require days or years, compressed into a few minutes of the slower time of this borderline state. Material science has now proved that the nerve currents are electrical in nature and that man has an electromagnetic form. Electromagnetic waves when radiated move with the velocity of light; but electric currents traveling over wires or over nerves move much slower. In other words, in man�s electromagnetic form are velocities greater than those of ordinary physical substance, but which are not so great as the 186,284 miles per second (1942) that light travels. From what has already been said, it will be apparent that if a clock slows down relative to the velocity it acquires, as consciousness attains higher and higher velocities it will be able to have more and more experience within the space of four minutes of this slowed down time. At a certain velocity, which is well within the limit of what can be expected to occur in man�s electromagnetic form, the ratio of the number of experiences in four minutes of slower time, to the number of experiences in the faster time of external life, is 365� to 1. As the ratio of velocities between one electromagnetic region of man�s body and his physical existence is 365� to 1, the occurrences that took place in a little less than four minutes of this slower Major Progression Time, when expressed in the faster Calendar Time of the external world occupy a duration of 24 hours, and what took place in 24 hours Major Progression Time of the boundary region, when externalized on the physical plane takes 365� days of ordinary Calendar Time; that is, what took place in one day in the boundary region, when externalized takes place in one year of the faster physical time. As the ratio of velocities between another electromagnetic region of man�s body and his physical is about 13 to 1, the occurrences that took place in approximately 2 hours of this slower Minor Progression Time, when expressed in the faster Calendar Time of the external world occupy a duration of 24 hours, and what took place in 27.3 days of this Minor Progression Time in the boundary-line region, when externalized on the physical plane takes 365� days of ordinary faster Calendar Time; that is, what took place in 27.3 days of this Minor Progression Time takes place in one year of faster physical time. Progressed aspects indicate time-velocity transformations of energies, released according to the day-year, month-year, or year-year ratio, which bring about structural changes within the astral body. These structural changes enable the stellar cells to receive additional energies from the planets and thus gain the impetus to work, from the inner plane, to bring events of a definite type into the life. The energy release, as mapped by a progressed planet, is in that compartment and zone of the astral body mapped by the house and sign of the birth chart in which the progressed planet is located. Thus a planet merely moving through a house of the birth chart by Transit, by Minor Progression, or by Major Progression, brings about a structural change in the astral body which enables it to receive energy, of the nature indicated by the progressed planet, in that region. The energy release shown by a progressed planet forms a temporary stellar dynamic structure within the astral body. This acts as a radio receiving terminal for picking up and transmitting to that compartment of the astral body the energies of the vibratory rate of the planet. When such a progressed planet forms an aspect with a planet in the birth chart, or with another major-progressed planet, the energy release builds across the astral body a line which acts as an aerial which picks up and transmits to its two terminals, energy of the types of the two planets involved in the aspect. 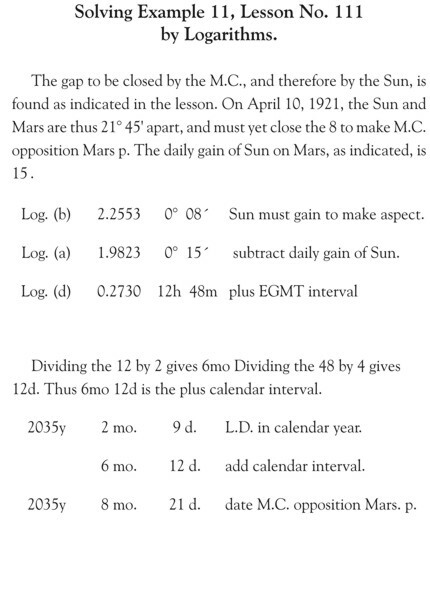 In our extensive statistical studies we have found that when Mars or the Sun is involved, and at the same time there are other heavy progressed aspects which act as Rallying Forces, the indicated events may occur when the progressed aspect is as much as a degree and a half from perfect. But as a general rule the effective orb within which the event indicated by a progressed aspect may be expected to take place is one degree from the perfect aspect. Before it reaches one degree from perfect the line across the astral body usually has not become dense enough to act as an effective aerial. But at one degree from perfect it is dense enough to pick up about one half the peak load of the aspect, gradually increasing in power until the peak is reached when the aspect becomes perfect, then decreasing in power until at one degree beyond perfect it picks up only about one-half the peak load, past which point it usually has dissolved so far that it is no longer an effective receiver. While within one degree of perfect the progressed aspect maps a temporary aerial stretching across the astral body which picks up astral energies from the planets, from the thoughts, and from the character vibrations of objects, which are of the frequency of either planet, and transmits them to the stellar cells mapped in the astral body by these planetary terminals. These temporary stellar aerials thus formed by the cyclic release of energy, have a length indicated by the aspect which maps them, and this determines whether the astral energy, from any source derived. which they pick up, will be given a harmonious turn, or will be loaded with discordant static. To the extent they transmit energy which is harmonious to the stellar cells at their terminals, are the thought cells there given impetus to work to attract favorable events. Likewise, to the extent these temporary stellar aerials transmit energy which is discordant to the stellar cells at their terminals, are the thought groups there located given an impetus to attract misfortune. But in thus considering the type of activity of any group of thought cells in the astral body as accelerated by new energy received, the type of activity they already possess, due to the conditions under which they originally were formed as modified by conditioning since human birth, is fully as great in importance as the quality of the new energy received. That is, if they are composed of inharmonious thought compounds, as mapped by unfavorable birth-chart aspects, the mere adding to them of a supply of harmonious energy is not sufficient markedly to change their nature. Or if the compound of which they are formed is quite harmonious, as shown by the birth-chart aspects, the mere supplying them temporarily with discordant static does not cause them to feel so intensely malignant that they work to attract misfortune. Any energy supplied by a temporary stellar aerial is thus of no more importance in determining the amount of harmony or discord which a group of stellar cells feels than are the permanent aerials mapped by aspects in the birth chart. These permanent stellar aerials, unless changed through the deliberate cultivation of new processes of thought to dissolve them, not only indicate the nature of the thought compounds at their terminals, but they continue to feed them with astral energy of the harmony or discord denoted by the aspects. And because the thought elements in the compounds were originally united as indicated by the aspects, and continue to receive some energy of the same quality, the temporary energy afforded by a less permanent stellar aerial is limited in its power to cause them to act in a manner different than has been their custom. In predicting what events will be attracted into the life at a given time, therefore, the first thing to do is to consider the normal composition and activity of the thought cells within the compartment of the astral body affected. Then consider the volume, type, and harmony or discord of the energy added to the stellar cells within the compartment, and estimate not merely the amount of activity which will result from this new energy supply, but also how the new energy supply modifies or accentuates their normal feeling of harmony or discord. The importance of the event, other things being equal, will be in proportion to the volume of energy received. That is, in the same physical environment it is always in proportion to the amount of thought-cell activity. But the fortune or misfortune of the event�its harmony or discord�cannot be determined solely by the harmony or discord of the energy added. The new energy merely modifies the normal feeling of pleasure or pain of the stellar cells. It does not change them completely. Thus the fortune or misfortune of the event cannot be ascertained merely from the harmony or discord of the progressed aspect in relation to the physical environment, but must be determined from the harmony or discord of the stellar cells made active in relation to the environment. Because of the smaller volume of energy picked up by their temporary stellar aerials, only events of less importance are attracted by the stellar cell activity indicated by Minor-Progressed aspects and Transit aspects. No event of outstanding importance will be attracted into the life unless there is a much stronger temporary stellar aerial, mapped by a Major-Progressed aspect, within approximately one degree of perfect, stretching across the astral body. The event attracted by the additional thought-cell activity will, of course, relate to a department of life to which the stellar cells, as mapped by their house position in the birth chart, belong. That is, the event will refer to one or more of the compartments in the astral body which, by house position, the planets involved in the aspect rule. And the circumstances attending the event will be characteristic of these planets. It is not a difficult matter�because the progressed planetary aspects so reliably indicate the time of formation of temporary stellar aerials across the astral body which pick up and deliver new astral energy to definite groups of stellar cells�accurately to predict about when, and relating to what departments of life, an event will happen. But it is far more difficult to determine its importance, how fortunate or unfortunate it will be, or the specific event. The reason the degree of fortune or misfortune of the event is difficult to determine is not only due to the resistance or facilities which environment offers to bringing about what the thought-cells desire, but also that a variety of conditions may influence the stellar cell activity as to harmony or discord. The normal way the thought cells feel, in the compartment of the astral body influenced, must be estimated. Then must be gauged just how much this normal feeling will, or will not, be changed by the new influx of energy. Furthermore, it must be considered to what extent, if any, Rallying Forces, indicated by other progressed aspects, will be able to reach these stellar cells with their type of energy. That is, there is always the factor of the general Mental Attitude; because if this, in spite of the particular progressed aspect under consideration, keeps the consciousness tuned in on some other type of feeling, this supplies the stellar cells at the terminals of all stellar aerials with energy of this harmony or discord, and their activities to attract fortune or misfortune are modified accordingly. The reason progressed aspects usually work out in terms of their own harmony or discord is because few persons resist permitting themselves to think and feel, at such times, that which is indicated. Even the unwitting application of Mental Alchemy or Rallying Forces, as by those who because of their religious convictions or belief in New Thought continue to feel cheerful and happy in spite of apparent adversity, quite markedly, as we have had occasion to observe, modifies the misfortune that otherwise might be expected from a severe progressed aspect. In other words, what is attracted to the individual is not due to the birth chart or to the progressed aspect, but is due to the activity of the thought cells within the astral body, working from the inner plane. Anything, therefore, which alters this thought-cell activity, from whatever source it comes, or which alters the resistance of the physical environment to that which the thought cells strive to bring to pass, also alters the fortune. It is because structural changes within the astral body�which as to time and nature can be ascertained by calculating Major Progressions, Minor Progressions and Transits�are commonly the most influential means through which astral energies are added to the stellar cells within the astral body, that these become of utmost importance in every human life. The positive influences in an individual�s life, measuring the releases of energy which bring structural changes in his astral body at times which can be predetermined, that in turn afford certain stellar cells with the energy to attract events, with which an astrologer should concern himself, in addition to the birth chart, are only these three: Major Progressions, Minor Progressions and Transits. The only difference to be observed in the influence of these three measures of progression is in the relative amount of structural change indicated by each, and consequently the volume of energy afforded the thought cells above their normal amount, which makes the events attracted relatively important or unimportant. That is, the structural changes indicated by Transits give the thought cells only enough additional energy to attract inconsequential events. The structural changes indicated by Minor Progressions afford the stellar cells enough energy to attract the minor events of life. But it is only the structural changes indicated by Major Progressions which afford the thought cells in any compartment of the astral body with sufficient additional energy that through their inner-plane activities they can attract important events into the life. Major progressions are measured by the ratio of the movements of the planets during one apparent solar day releasing energy which causes the chief structural changes within the astral body that take place during one astrological year in the life of man. This simply means that the movements and positions of the planets each four minutes after birth indicate the structural changes that take place within the astral body each day after birth; that the movements and positions of the planets each two hours after birth spread the structural changes so shown over each month of life after birth and that the movements and positions of the planets each day after birth relate to the structural changes within the astral body that take place during the corresponding year of life. To calculate the time, therefore, when any particular structural change of major importance will take place, is merely a matter of solving a simple problem in proportion. Up to 1942 it had been the custom to solve the simple problems in proportion involved in ascertaining when given major-progressed aspects would be perfect in the manner still followed in the text of Chapters 2, 3 and 4 (Serial Lessons 111-113). 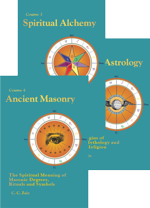 But in that year I published the reference book, Progressed Aspects of Standard Astrology, in which the simple problems in proportion involved in calculating progressed aspects are solved through the use of logarithms. It should be understood that the precise time a progressed aspect is perfect is exactly the same whether the method of proportion is employed or the method of logarithms. We discover, however, that some students find logarithms easier to use than proportion, while other students find proportion easier. Which is used is quite optional, as the final result is exactly the same. It will be seen that as a planet�s movement between two consecutive noons in the ephemeris is the equivalent of 12 months Calendar Time by major progression, that the planet�s movement during 2 hours (12 of 24 hours) is the same as 1/12 of the planet�s movement during the same 24 hours. Whether the planet�s motion during 24 hours is divided by 12, or its motion during 2 hours is calculated, the result is the same, and in either case represents its travel by major progression during one month of Calendar Time. In other words, it follows from the time-velocity relativity which permits astrological energies to be released by progression, that the position of a progressed planet may be calculated either by its proportional movement through space (as illustrated in the text of the lessons which follow), or by its proportional movement relative to time (which is the method of logarithms). In placing the planets in the chart of birth when erecting the horoscope it is customary to find the distance that a planet has moved from ephemeris noon position by adding (d) the logarithm of the EGMT Interval, to (a) the logarithm of the daily motion of the planet. The logarithm so found is then (b) the logarithm of the distance the planet has traveled. Therefore, if we wish to know (d) the EGMT Interval it takes a planet to travel (b) a given distance required to complete an aspect, it is obvious we must merely reverse this process, and subtract (a) the logarithm of the daily motion of the planet, from (b) the logarithm of the distance the planet moves. 24 hours (one day) major progression (ephemeris EGMT Interval) time equal 12 month (one year, or 365� days) calendar time. 2 hours (120 minutes) major progression (ephemeris EGMT Interval) time equal 2/24 years (one month or 30 days) calendar time. 4 minutes (120 minutes divided by 30) major progression (ephemeris EGMT Interval) time equal 1/30 month (one day) calendar time. 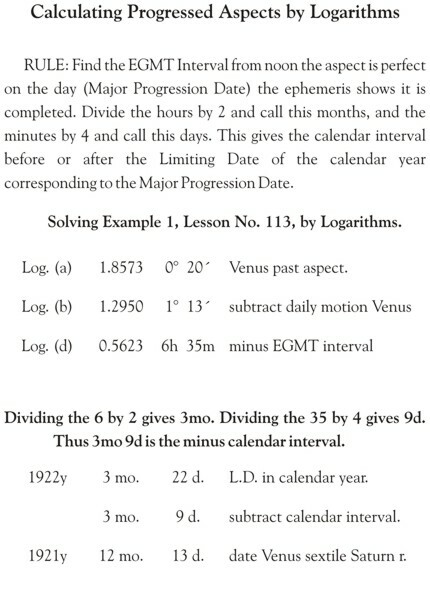 Now, as ephemeris EGMT Interval is major progression time which can always be converted into Calendar Time according to the ratio just indicated, the EGMT Interval from noon on the day of birth�for which the distance the planets had traveled from their noon positions were calculated when finding their places in the birth chart�can be converted into Calendar Time. The noon positions of the planets on the day of birth thus represent their progressed positions on a definite calendar date. Mathematically it makes no difference if the calendar date found occurs before the birth of the individual, for in that case we have merely moved back from birth to get a starting point for calculating progressed positions during his life. It should be obvious that if in placing the planets in the chart of birth we moved them forward from ephemeris noon positions�using a plus EGMT Interval�that to get them back to noon positions we must subtract their movement from their ephemeris positions. Also if we are to ascertain the Calendar Date corresponding by major progression to this moving the planets back to their noon positions, we must move back from birth the calendar interval represented by the EGMT Interval during which the planets thus are moved. However, if in placing the planets in the chart of birth we moved them back from ephemeris noon positions�using a minus EGMT Interval�to get them again to noon positions we must move them forward their motion during the same EGMT Interval. And if we are to ascertain the Calendar Date corresponding by major progression to this moving the planets ahead to their noon positions, we must move ahead from birth the calendar interval represented by the EGMT Interval during which the planets are thus moved. Whether the method followed in calculating the progressed aspects is that of proportion or that of logarithms, the calendar date thus found�called the LIMITING DATE�constitutes the most convenient starting point in calendar time. The Limiting Date (L.D.) must include year, month and day of calendar time. As the positions of the planets in the ephemeris on the day of birth represent their major-progressed positions on the L.D., the positions of the planets in the ephemeris on the day following birth represent their major-progressed positions on the month and day of the L.D. in the following calendar year; each succeeding day in the ephemeris showing the major-progressed positions of the planets on the month and day of the L.D. in the corresponding calendar year. The ephemeris date which shows the positions of the planets by major progression as they appear for the month and day of a given calendar year is called the Major Progression Date. And for finding it we use the Limiting Date as the base or starting point in calendar time, and the day of birth as the base or starting point which is equivalent to it in progression time. Thus to find the Major Progression Date we merely count ahead in the ephemeris from the day of birth (major progression time) as many days as years of life (calendar time) have elapsed since the Limiting Date. To find the progressed M.C., add to the birth-chart M.C. the number of degrees and minutes the Sun has progressed since birth. To find the progressed Asc., take a table of houses for the latitude of birth and merely ascertain the degrees and minutes on the Asc. with the progressed M.C. already found. Other progressed house cusps are not wanted, but if they were, they could be taken from the table of houses corresponding to the progressed M.C. and Asc. The M.C. and Asc. are unique positions, unlike other house cups. The M.C. marks a thin blue line through the astral body which acts as an amplifier; while the Asc. is a heavy line which serves as a ground wire over which electromagnetic energy reaches the outside world. Very extensive experience leads to the conviction that not merely in the birth chart, but also by progression, these two positions act very much after the manner of planets. In many, many thousands of birth charts with progressed aspects worked out to the time of events handled by our research department, we have never, however, found it necessary to consider aspects to any other house cusps in the birth chart, or to progress the cusps of houses other than the Asc. and M.C. The house cusps of a birth chart map the dividing membranes between one compartment in the astral body and another. These astral membrances mapped by the house cusps do not act in the manner of planets. Consequently, while we progress the Asc., M.C. and planets through the houses of the birth chart, there is no progressed chart, in the sense of progressing all the house cusps, in the Hermetic System. We have done a vast amount of research work on progressed aspects, and we find they invariably work out in terms of the houses of the birth chart through which the planets are progressing or which they rule. The reason the M.C. 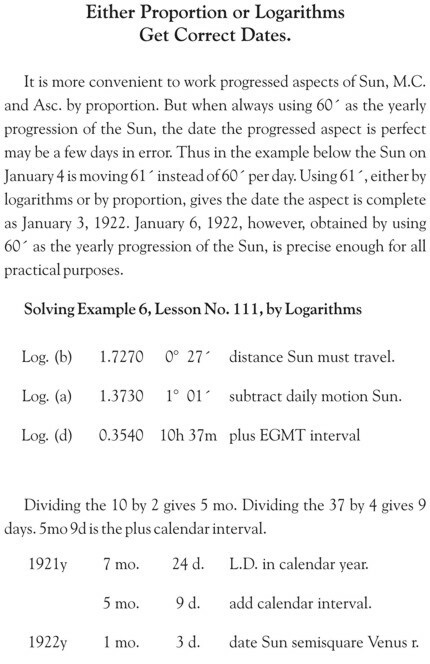 is progressed the same distance the Sun moves by progression is that this avoids an error, due to the difference between mean time and true or apparent solar time, which is introduced when the progressed M.C. is found by using the mean time of birth on the major progression date. This discrepancy in extreme instances would cause an error of approximately 7� degrees in the progressed M.C. and Asc. ; which is the equivalent of about 7� years. But such an error in timing the progressed planets would be less than 8 days. On the average, in calculating progressions for middle life, the discrepancy amounts to, perhaps, 2 to 12 minutes. This would cause an error of from one to three days in timing planetary progressions, which is close enough for practical purposes. But in timing the progressed aspects of the M.C. and Asc., the error would be from one to three years, which cannot be tolerated. Minor progressions are measured by the ratio of the movements of the planets during one astrological month releasing energy which causes the minor structural changes within the astral body that take place during one astrological year in the life of man. This means that the movements and positions of the planets while the Moon passes through each degree of the zodiac after birth indicate the minor structural changes that take place within the astral body each day after birth; that the movements and positions of the planets while the Moon moves one sign through the zodiac represent the minor structural changes in the astral body during one month of life; and that the movements and positions of the planets while the Moon moves through the whole zodiacal circle indicate the structural changes within the astral body that are spread proportionally over the whole year. 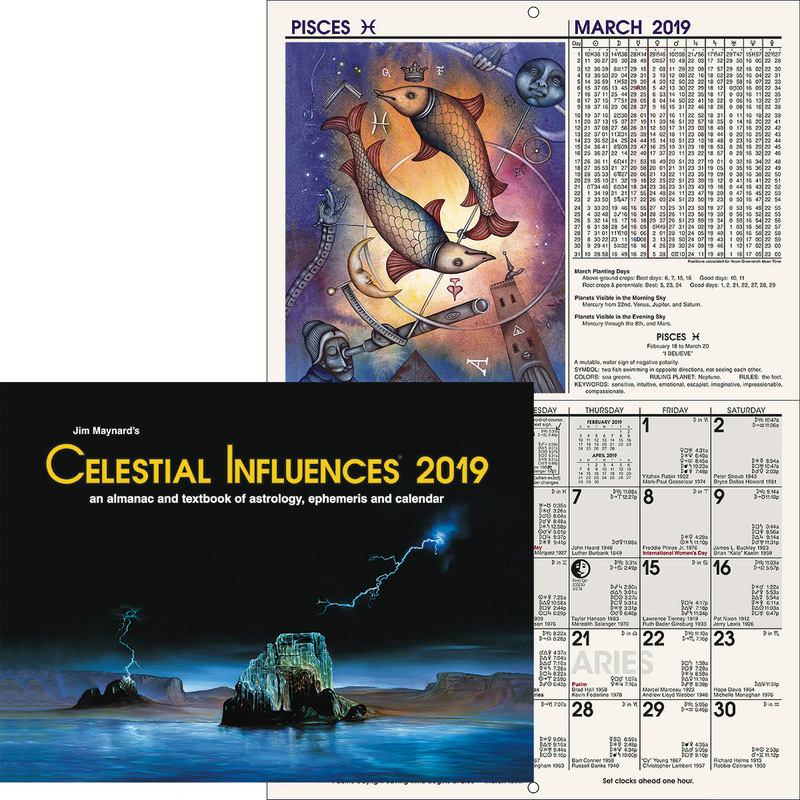 RULE: From the position of the Moon in the zodiac at birth, count ahead in the ephemeris as many astrological months�successive transits of the Moon over the degree and minute of the zodiac it occupied at birth�as there have been completed years of life. The positions of the planets, M.C. and Asc. during the following astrological month will form the Minor Progressions for the year of life following the birthday. The M.C. progresses the same number of degrees that the Sun has progressed by Minor Progression. As the Sun is always the same number of degrees zodiacally from the M.C. as at birth, the M.C. is easily found from the Sun�s position by Minor Progression; adding or subtracting from the Sun�s minor position its zodiacal distance from the M.C. at birth. The progressed Asc. may be ascertained from a table of houses for the latitude of birth by using the M.C. so found. The aspects formed by the progression of the planets, M.C. and Asc. at the rate of one astrological month for each year of life, as strictly between Minor-Progressed positions produce imperceptible effects. But when formed between Minor-Progressed planets and angles to the planets and angles of the birth chart, or to the positions of the major-progressed planets and angles, they produce structural changes within the astral body which attract the minor conditions and events of life. Transits are measured by the ratio of the movements of the planets during one astrological year releasing energy which causes the inconsequential structural changes within the astral body that take place during one astrological year in the life of man. This means that the positions of the planets shown in the ephemeris, from day to day, bring about small structural changes in the astral body on those days. RULE: The transits of the planets through the houses, especially the slower moving planets through angular houses, should be noted. The conjunction aspect of transiting planets with birth-chart or major-progressed planets in particular is worth observing, and next, the oppositions thus made by the slower moving planets. Only the aspects made to birth-chart positions and Major-Progressed positions should be noted; no attention being paid to transiting aspects to Minor-Progressed positions, or to other Transiting positions. In our very extensive research work we have been unable to notice any difference in the influence exerted by Major-Progressed aspects, Minor-Progressed aspects and Transit aspects, other than the volume of energy supplied the stellar cells as indicated by the importance and magnitude of the event attracted. The events which many people believe to be occasioned by transiting planets are really coincident with major-progressed aspects which have formed heavier temporary stellar aerials. Under such circumstances the transit, which merely aids the Major Progression, and which fails to work when no such Major-Progressed aspect is present, is often accredited with full responsibility for attracting the event. Except when influenced by Rallying Forces, each progressed aspect tends to work out in terms of its own departments of life as indicated by the house rulerships of the planets involved. That is, progressed aspects do not annul each other, but each attracts its own type of event. Very frequently, however, the fortune or misfortune of the event is not indicated by the harmony or discord of the aspect, but is powerfully influenced by the dominant progressed aspect at the time acting as a Rallying Force. The indicated major event may be expected during the time the progressed aspect is within approximately one degree of the perfect aspect. The same orb of influence is effective for sub-major-progressed aspects (major-progressed aspects of the Moon), for minor-progressed aspects, and for transit aspects. For an event to be attracted by any of the three types of progression it is not necessary that any other type of progression contribute to it. But during the period a major-progressed aspect is within the indicated distance from perfect there will occur several brief periods when due to the major-progressed Moon, or a minor-progressed planet, or both, or several minor-progressed aspects, forming an aspect with one of the planets involved in the major-progressed aspect, or affecting the house ruling the anticipated event, the thought cells working for the event are given unusual accessory energy. And it may confidently be expected the event will occur on one of these peaks of thought-cell activity. The event indicated by a major-progressed aspect is not much influenced as to its fortune or misfortune by the harmony or discord of the sub-major aspect or minor-progressed aspect which gives its thought cells accessory energy. Within the larger pattern of conditions indicated by the major-progressed aspects, each sub-major aspect tends to work out in terms of a sub-major event or condition, and each important minor-progressed aspect tends to work out in terms of a minor event or condition. 1. Eliminate all events which do not bear the characteristics of one of the two planets involved and all events not belonging to the houses influenced. MARS: Any progressed aspect of Mars brings strife, haste, and increased expenditure of energy. 2. Eliminate all events improbable because of lack of proper birth-chart planetary power, or lack of proper birth-chart aspects, or lack of proper birth-chart house activity. 3. Eliminate all events which the education and training of the individual, and the habit systems his thought cells have acquired make unlikely. 4. Eliminate from the remaining events those which do not fit into the pattern as influenced by Rallying Forces. 5. Eliminate from the few events that still remain those which the age of the individual make unlikely and which the environmental factors belonging to the two planets involved are not present to bring about. Even after this process of elimination, there may remain several alternate events any one of which apparently might happen. But from the viewpoint that ascertaining the most probable event is not to foretell the inevitable future, but to be able to influence what actually happens, the residue thus found should be highly satisfactory; for one should not be unwilling to take steps facilitating several different events or deflecting several other different events, if by that effort the event when it actually occurs is made far more fortunate. Either Proportion or Logarithms Get Correct Dates. Solving Example 11, Lesson No. 111 by Logarithms.